The ISAP symposium that year brought us out to NAS Whidbey Island to photograph aviation operations at the base. This was the closest I’ve been to with a C-9, an aircraft based on the DC-9 airliner. 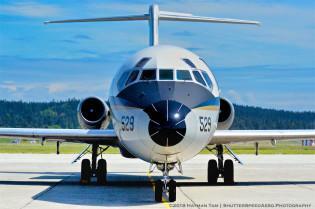 It was produced as the C-9A Nightingale for the USAF, and the C-9B Skytrain II for the USN and USMC. The C-9B provided cargo and passenger transportation for the Navy and Marine Corps while the Air Force used the C-9A for aeromedical evacuation purposes. Introduced in 1968, the Air Force retired theirs in 2005 and the Navy retired their last one in 2014, leaving only two in service with the Marines. Nikon D7000 w/70-200mm.